Johann Elias Ridinger (Ulm 1698 – Augsburg 1767) + Georg Adam Eger (? 1727 Murrhardt 1808). Two etchings from Ridinger’s Par Force Hunt of the Stag in their plain image size printed on grounded sheet zinc, executed as oil paintings in the colors of Hesse-Darmstadt by Eger or his circle, probably partially with use of tempera. Supposedly 1764/68. 10¼ × 18⅝ in (26.2 × 47.2 cm). In green-bright gold frame. Kölsch, Gg. 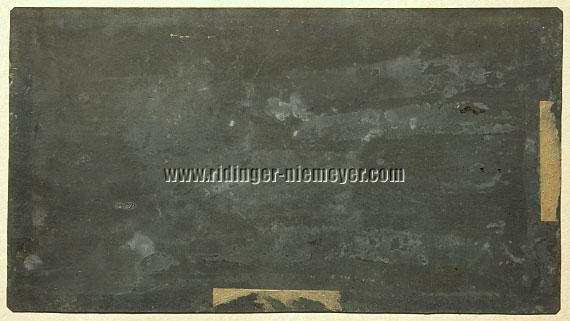 Adam Eger … (Hunting Painter at the Court of Hesse-Darmstadt / Catalog of the Works in the Museum Hunting Seat Kranichstein), 2010; Thieme-Becker, Eger, X (1914), 369; Siebert, Kranichstein, (Hunting Seat of the Landgraves of Hesse-Darmstadt), 1969; Hofmann, (Guide through the Darmstadt Hunting Museum Kranichstein Castle), 1981; Michel, (Ancestors and Relatives of the Animal Painter and Engraver) Joh. Elias Ridinger in (Papers of the Bavarian State Association for Genealogical Research), vol. XV, 1987, 396-414.
whose uniforms are “designed in the colors of the landgraves, later grand-dukes of Hesse-Darmstadt. 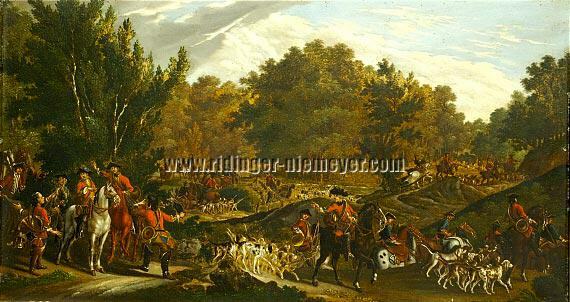 Especially by Georg Adam Eger … there exist quite a number of hunting paintings which correspond almost down to details with your colors” (German Hunting and Fishery Museum). Engaged 1748 at the court of Darmstadt as just 21-years-old for the superintendence of the painting of the legendary so-called Imperial Presentation Clock, he belonged beside the brothers Knaus as the mechanics 1750 to the train of four, who presented the showpiece in Vienna on occasion of the 5th anniversary of Emperor Franz I and the 10th of his spouse Maria Theresa as Queen of Hungary. The relation Ridinger-Eger seems to date back to a stay of the latter in Augsburg before 1748, from where he should have gone directly to Darmstadt through the intermediary of the Darmstadt court mechanic and clockmaker Ludwig Knaus. The latter stayed in Augsburg 1748 “to superintend there the production of the box of the (above) presentation clock from silver and tortoise-shell”. See on this Kölsch pp. 11/II & 26/II together with footnotes 4 & 78. But also Joseph Prince of Hesse-Darmstadt as from 1740-1768 prince bishop at Augsburg might, rather should have been instrumental in the later close relation of the Ridingers to the court in Darmstadt. After Eger’s designs Martin Elias (Thieme-Becker erroneously “Joh. El.”) worked seven (Kölsch 25/I erroneously 5) engravings, that is Th. 318/319 (as the only ones of these with also reference to his father, “direxit et excud. Aug. Vind.”), 339, 340, 352, 373 & 1378. At which with regard to Darmstadt the matter not nearly rests. For inclusive of five sheets of the afore-mentioned group at least 13 works – Th. 292, 297, 299, 300, 305, 318, 319, 332, 339, 340, 342, 356, 1378 and by this most of those which can be attributed by name – are dedicated to Louis VIII and his reign, six of them worked entirely by Johann Elias alone and one jointly with Martin. The discussion of this close contact is important for both the artistic as also the chronological classification of present sheet-metal paintings. For since microscopical examinations on the basis of picture Th. 61 in both the Regional Museum Bonn and the Municipal Art Collections Augsburg – repeated thanks for this to Mrs. Kalus and Mr. Beier – have revealed unobjectionably that the painting was not done on mounted impressions on paper, for which according to the kind information of the paper restorer of the Art Museum Bonn, Mrs. Büttner, sheet-zinc would not be suitable just for pure technical reasons, yet the plates show in every detail the entire image part of the etchings, they therefore must be, as known as quite possible, direct impressions from the original plates onto the grounding of the plate-zinc. This, however, inevitably requires the co-operation of the Ridingers, as then indeed given by the afore-mentioned close nexus. (Siebert, op. cit., pp. 90 ff. and, in respect of the same for buildings, 82). 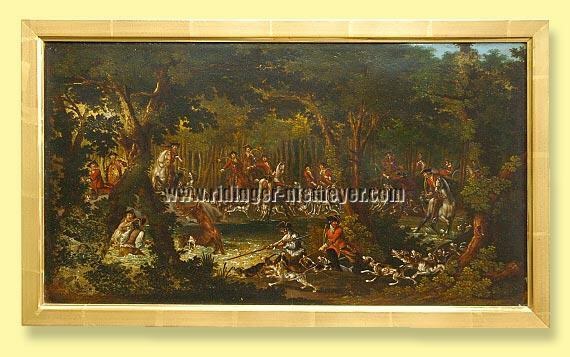 Coinciding with this environment present painting overs, executed likewise on plate-zinc, from Ridinger’s Par Force Hunt, which originally should have been done as complete set of all 16 stations and in every aspect correspond quite singularly with Louis’ predilections. should be considered, at which of the latters both Johann Elias himself as partly by the works referring to Louis – here plate dates from already 1753, Th. 299 & 300 – and Martin Elias, deceased 1780, are possible as engravers of Eger’s designs. 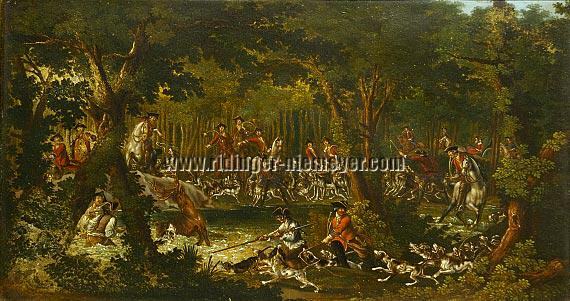 They concern the sets of the Most Wondrous Deer (1768) and the Special Events and Incidents at the Hunt (1779) finished/published posthumously by the sons (Johann Jacob’s decease 1784 would be an unreservedly supposed final chronological mark for the part of the Ridingers, but see below, too), among which with Th. 373 one of Hohenlohe of 1775, and the special position Th. 1378, both per Eger/Martin Elias. 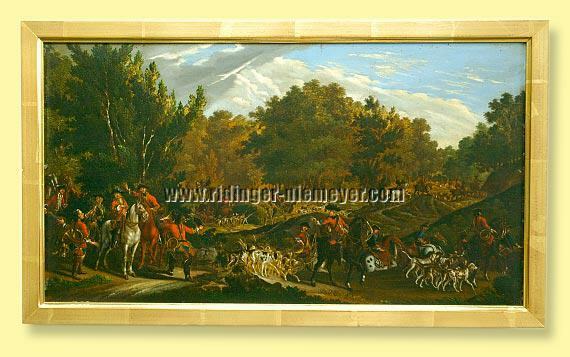 Since also the set of 1779 is based beside Eger completely or yet predominantly on drawings by Johann Elias, deceased 1767, the actual co-operation concerns the years before 1768, Th. 1378 included. Belonging to the complex of the Princely Persons mounted on Horseback, the latter shows Louis VIII who died mid-October 1768. With his passing away Eger’s vocation in Darmstadt came to an abrupt stop. (Siebert, op. cit., pp. 33 & 56 f.). as then Ridinger generally – so to speak as a further trace to the history of creation of the present ones – enjoyed greatest esteem at the court at Darmstadt. plates to seize the opportunity . For already the just 50-year-old had “nevermore believed that (he) would take the brush once more” as he expressed by letter of June 29, 1748 towards Wille in Paris (Décultot, Espagne & Werner [ed. ], Joh. Gg. Wille, [Correspondence], 1999, page 76), at the same time complaining that he could not yet evade to accept a corresponding renewed desire of Catherine the Great at Petersburg for four further paintings. For the ones presently there see Nikulin, The Hermitage Catalogue of Western European Painting XIV (1987), 284-287.